All words are masks and the lovelier they are, the more they are meant to conceal. I had thought that words were instruments of precision. Now I know that they devour the world, leaving nothing in its place. God pity the poor novelist. 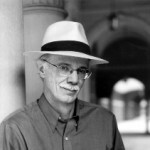 Steven Millhauser is an American novelist and short story writer. He won the 1997 Pulitzer Prize for Fiction for his novel Martin Dressler. The prize brought many of his older books back into print.